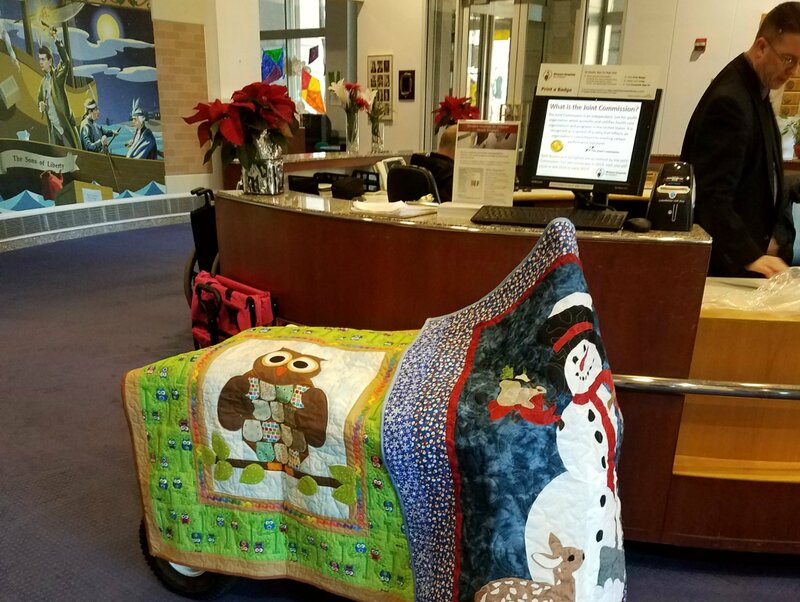 The Comfort Quilt Program is designed to provide donated quilts to those in need. This may be hospitals – Oncology Departments, Pediatric Departments, Neo-natal Units, or nursing homes, local shelters and care centers, visiting nurse associations or in response to a disaster, such as a fire. Our focus is on finding organizations that are currently not being supported by other Guilds or Church groups. If you know of an organization or someone in need, please let the program coordinator know. Quilts of all sizes and types (infants, kids, adults) will be gratefully accepted. 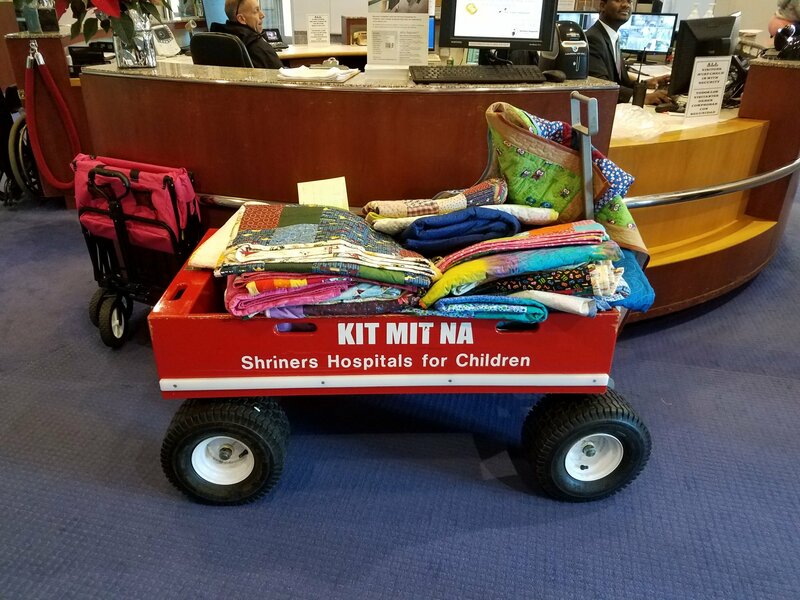 Kits are often available at the guild meeting. These kits do not have a deadline. Complete them at your pace and return the quilt to the coordinator when finished. These quilts do not have to be complicated or costly. Challenge yourself to use fabrics from your stash. If you like to piece but not quilt you can tie your quilt or partner with another member to get it quilted. 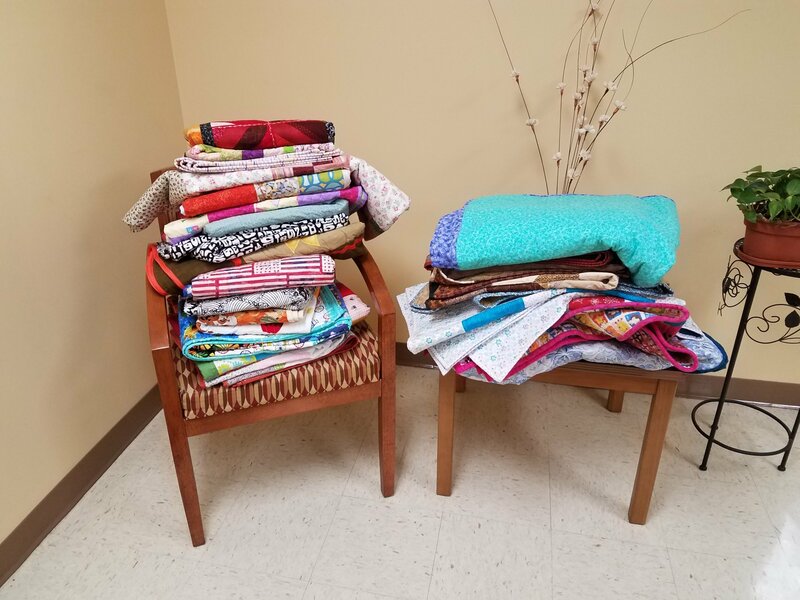 If you like to machine quilt, volunteer to quilt a donated top. Teamwork gets it done! Available Patterns: Patterns that have been used to create kits include: Super Simple 9 Patch, Reversible Crib Quilt, Double Bars Scrap, Shamrock Shake and Simple Scrappy. Click on any one of these to obtain and print the pattern. There are many websites offering Free Quilt Patterns. Here is one to check out. Free Quilt Patterns.com. Check the Resources section of the website for additional links. Fabrics should be 100% cotton or flannel. EVERYTHING should be constructed to withstand many washings and without embellishments or buttons that could come off and become a choking hazard. Do not use invisible thread on infant quilts as it may come loose and wrap around tiny fingers or toes. Always double check for pins. NO GLITTER FABRICS please - Glitter can flake off and get into open wounds, causing serious issues! Wash quilts in unscented detergent and do not use fabric softeners. Strong smells of chemicals or smoke may jeopardize the health of a patient. For additional information refer to the coordinator listed on the contacts page. Together we can make a difference in the lives of others.